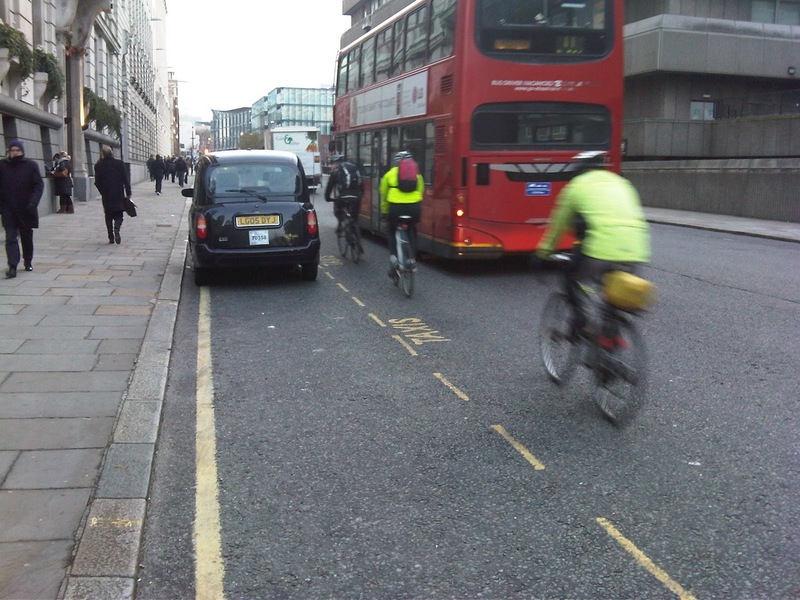 Cyclists in the City: "There is competition for road space. And it is unlikely to get any easier." In other words, nothing's going to change. "There is competition for road space. And it is unlikely to get any easier." In other words, nothing's going to change. 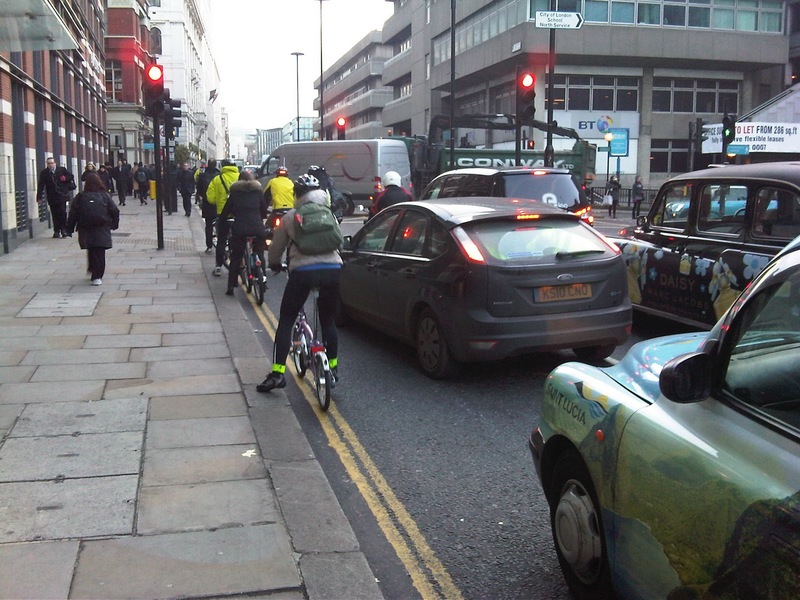 Ah the joys of cycling in the City of London. Once you've managed to brave the right-hand turn over Blackfriars Bridge, you arrive here on Queen Victoria Street. As you can see, there's lots of room for cycling in. As soon as the traffic lights go green, the cars will magically move over to give you lots of room as they overtake, obeying the Highway Code requirement to give you as much space as they would a car, in fact more than that as you are a vulnerable road user. The problem is that our politicians just don't get it. They do understand that more and more people are cycling. They do understand that they need to provide some sort of facilities to cater for that change. But they don't understand that they actually need to prioritise cycling over other forms of vehicular transport. "However, the fact is there is competition for road space, and it is unlikely to get any easier. The traffic jams will get worse, and yet more people will decide to use a bicycle as a means of getting through the traffic. The City is not going to resist this trend, but will seek to manage the street space we have in the best way possible....We are looking to increase the number of advance stop lines to make it safer for cyclists at traffic lights, and for the police to enforce compliance by motorists." Pro-cycling. Aware of cycling. Aware of compliance issues. But advance stop lines are not the solution. Because as soon as you pull away from this junction, what you get is parked cars on the left, buses on the right. And cyclists squeezed dangerously between the two. Here's what I mean in this picture on the left, just slightly further along from the traffic lights. The situation here is actually about to get worse. That taxi rank on the left hand side is going to become a coach park. Reason for that is that the coach park at St Paul's is for the chop. See here for those plans. 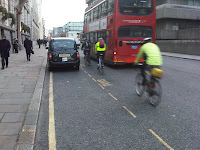 So, even more squashed cyclist space. "As my commute passes right through the city once or twice a week on a BorisBike, I'd love to see a real segregated superhighway from Blackfriars to Liverpool St... "
Fat chance, I'm afraid. You see, the City acknowledges it has more and more people cycling. It acknowledges there is more competition for that space between motor vehicles and people on bicycles. But the plan is for more of the same. "It is unlikely to get any easier". Let's just remind ourselves what the status quo looks like, perhaps here, here or here. "Pour se déplacer en ville ou dans les bois de Boulogne et de Vincennes, la Ville de Paris aménage des espaces dédiés au vélo pour favoriser et faciliter l'usage de ce moyen de déplacement calme et écologique." Paris is committed to developing spaces where cycling is prioritised and made easier than other forms of transport because Paris wants people to get about the city calmly and sustainably. The City's politicians are saying "there is competition for road space, and it is unlikely to get any easier". In other words, London is shrugging its shoulders, and pleasing no one by trying to please everyone. Politicians seem almost scared of upsetting the motorist. But if you want to cycle, you're just going to have to lump it. There will be more and more cars. And you'll just have to all muddle along. Screw that. I want a Paris politician. I want the City to actually stand up and say it wants the City to be a place where walking and cycling are more convenient than driving. Like Paris is doing. But that's not going to happen. Unless a lot of us (and I mean hundreds of us) start writing to our councilmen and demanding something changes. Question is, will you accept the status quo, or are you prepared to start writing? About everything and anything that bugs you in the City as you cycle through it. Well said. There are still the "Cycling Campaigns" that need to see it. I wonder when the politicians are going to realize that there is no way we can accommodate all the cars in central London. If the City Police West Area Community Partnership's reports on its priorities are anything to go by, don't hold your breath for action to control motorists - out of 72 fixed penalty notices issued between Jan and October in relation to their priority 2, "Traffic related offences in Fleet Street, Ludgate Hill, Holborn Circus and Fetter Lane, Ludgate Circus including Advanced Stop Lines", 63 were to cyclists, only 9 to motorists/bikers. Next meeting of the Partnership is 9 December, 5:30pm, 4 New St Sq. @ndru - indeed. The "recommended" cycle lane standard (2 metres wide) is not even met by the Superficial Cycleway, let alone this exemplar (on Vauxhall Bridge) of how Kulveer Ranger* thinks we'll become the world's greatest cycling city (in a few hundred years, based on current progress). As for "accommodating all the cars in Central London" - perhaps restricting the number of taxi and minicab licences would be a good start? *I don't think that Mr Ranger has ever specifically mentioned this lane, but there are plenty of other examples like this in London that he should know about.